We all realize the importance of setting aside time to take care of ourselves, but how many of us actually do it on a regular basis? Our lives seem to get so hectic and the “should do’s” start to pile up fast. This ever-increasing list can cause unneeded stress to our already busy lives, and guess what….stress is not healthy! As part of this year’s National Women’s Health Week, we encourage all women to pick a few things from the list below and add them into their lives. These healthy reminders may seem simple enough, but can make a world of difference in how we feel! As a women’s health specialist, I encounter women of all ages, activity levels and body types. 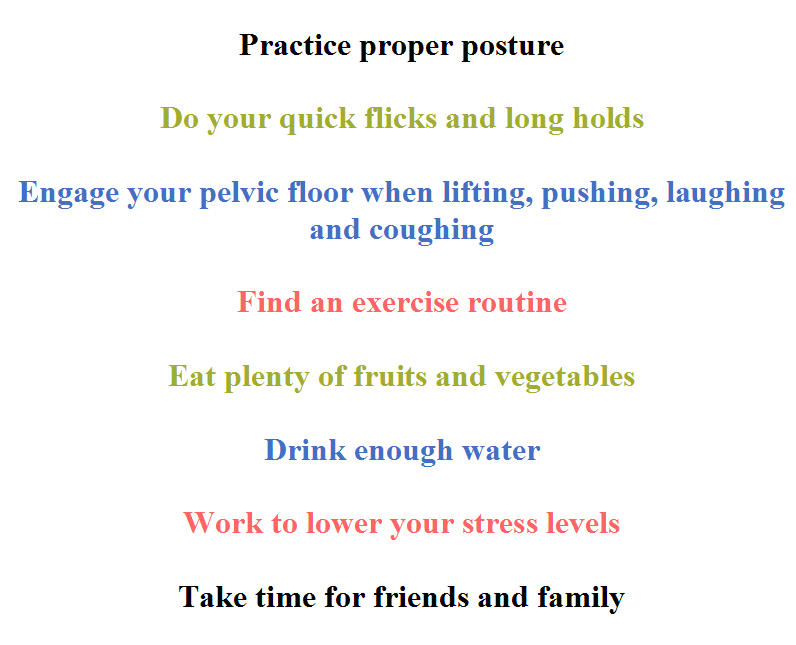 I always encourage my patients to find an exercise routine that they enjoy…eat foods that make them feel vibrant, to be aware their your posture, engage their pelvic floor during activity, and so on. Let us know which aspects from the list YOU are focusing on! Is there anything you would add to this list? Happy National Women’s Health Week! Women Deserve to Know: the Stretched Pelvic Floor Muscles (PFM) can recover after delivery! Heal your body, from the inside out!